You hear about (and see on reality television) people that are addicted to food. People that cannot, no matter what they do, stop themselves from eating everything and anything. And then there are people that have “food weaknesses.” For them, certain food items are addictive. They can’t help themselves from eating an entire jar of peanut butter, a bag of chocolate chips, or all the pot-stickers in stock at Trader Joe’s. Luckily, I suffer from neither of these conditions, but I think we can all identify with struggling to resist eating certain things in excess. For me, there are a few things I have a hard time saying “no” to. For one, gummy worms. Also, white cheddar popcorn. Tacos, chips and (good) salsa, chocolate covered raisins/cherries, and rolos. I LOVE rolos. 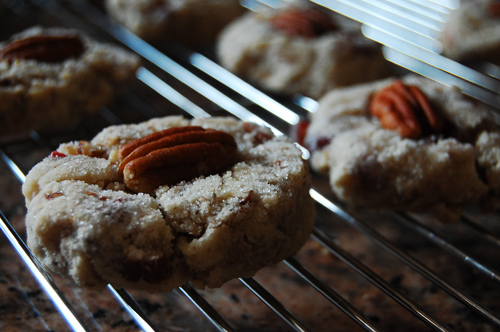 Pecan sandies. I’m not a huge fan of most cookies, I like them a specific way. But these particular cookies I could eat hundreds of. They have a great toasted pecan flavor, with hints of orange and almond. Perfect anytime of the day… in moderation, of course. Whisk together flour, salt, pecans, and cranberries. Set aside. 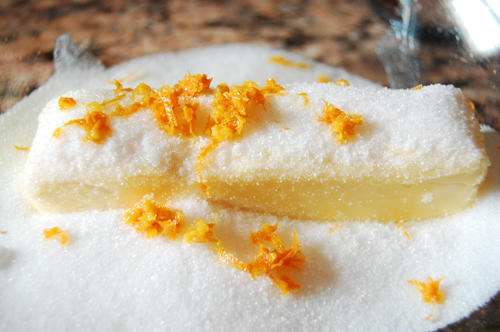 Cream together butter, sugar, almond extract, and orange zest. Slowly add in flour mixture until a dough forms. Roll the dough into a block and refrigerate 1 hour. Slice into 1/4 inch cookies and lay on an ungreased baking sheet. 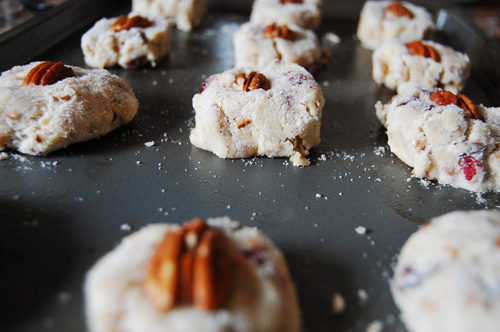 Press a whole pecan into each of the cookies. Bake for 10-12 minutes in a 350 oven.